It was a pleasure to take our Ecozoom Versa on a trip up to the coast. There was plenty of wind, but great views so we made a picnic spot high in the sand dunes. We found some fuel made some hot drinks and enjoyed the scenery. 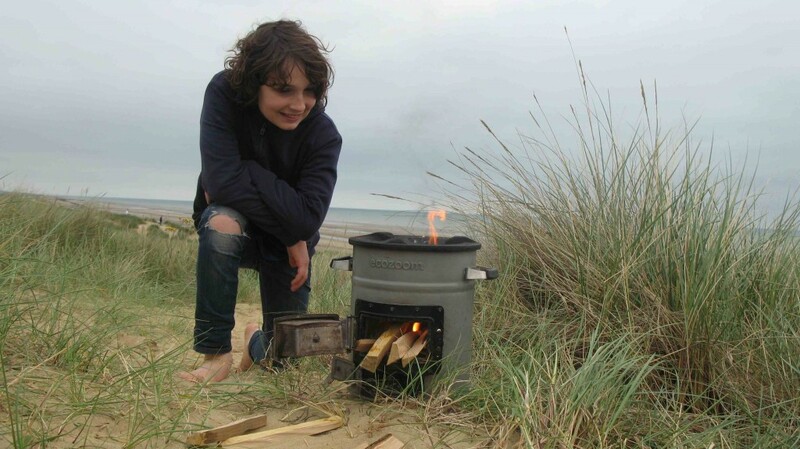 The Zoom rocket wood stove has the ability to burn nearly anything an open beach can supply, such as driftwood fuel. A couple of firelighters make life easy in this situation. Remember to angle the door openings, to make best use of the wind. If its blowing hard, point the doors away from the wind, or angle them slightly towards it to keep a steady intake of air. Always cover your pan, as the wind whips away heat and slows the boil. Getting hot drinks on the beach can be difficult, you can be far from an outlet. Overpriced low quality hot drinks can be a drag. Taking a flask needs preparation and the taste isn't fresh. Brewing your own is fun and can save a bit of cash, for other stuff. You can use your own cups, avoiding plastic waste from throwaways. With one of our lightweight rocket wood stoves you can enjoy the heat of a small fire letting you easily cook lunch and boil water for washing. Its like having a miniature kitchen, kicking out cooking heat. With a rocket stove you can keep burning as long as you like, on free, renewable fuel. Try our Ecozoom Versa next time you hit the beach!